Drillers like CNX Resources (formerly CONSOL Energy) file to drill new shale wells on a pretty regular basis, no big deal. 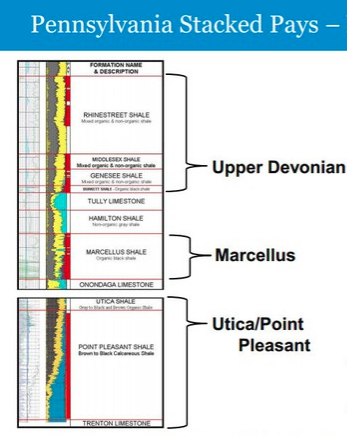 So why would we highlight CNX’s recent filing to drill four Utica wells in Westmoreland County, PA? In December, Columbia Pipeline asked the Federal Energy Regulatory Commission (FERC) for permission to start up an additional section of its Mountaineer XPress Pipeline in West Virginia (see Columbia Asks FERC to Start Up 2/3rds of Mountaineer XPress Pipe). The good news is that on Wednesday, FERC said yes. Another situation is brewing with Gulfport Energy not unlike the situation at EQT. One of (we’re pretty sure THE) largest shareholders in Gulfport, investment firm Firefly Value Partners, is not happy with either the board of directors or current management, saying very publicly (via a letter, below) that the current board lacks “necessary skills and experience” to turn the company’s poorly performing stock around. Ba boom! We expect liberal Democrats like the far-left PA Gov. Tom Wolf to keep harping on a Marcellus-killing severance tax on natgas production in PA, even though the state already taxes production via an impact fee (i.e. tax). That’s what lib Dems do! They take money from economic producers and give it away to economic parasites who vote them into office–like teachers’ unions. But we don’t expect Republicans to sponsor such dumb initiatives. Shell has calmed the troubled Ambridge waters–that is, the Ambridge Water Authority waters. Shell hit a snag with plans to build its Falcon Ethane Pipeline when the Ambridge Water Authority claimed construction of the pipeline under several streams feeding the Ambridge reservoir would endanger the drinking water for 30,000 people (see Ambridge Water Authority Strongly Opposes Shell Ethane Pipe Route). Honest to God, we want to know, how do people get this stupid? Four adult men–three so-called farmers and one 38-year-old egghead student–chained themselves to a fossil fuel-belching farm tractor in the middle of a busy road in Connecticut to block a shipment of turbines on the way to a new natgas-fired electric plant under construction…in order to protest fossil fuels.